With all of the features of our popular MMC220 wood meter, the MMI1100 moisture meter also includes data collection and is perfect for QC personnel for those applications where simple data analysis is critical. Common softwoods and hardwoods as well as tropical species. Other Building Products: Relative reading on materials with similar densities to wood. Designed for applications in either lumber producing or wood manufacturing markets, the MMI1100 moisture meter is easy to use, easy to program and offers data collection and assessment capabilities in the palm of your hand. With its Extended Range Specific Gravity (SG) to measure both domestic and exotic woods, the MMI1100 can quickly and accurately scan many board feet of lumber in just seconds and can store up to 50 moisture content (MC) readings for quality control data analysis. The meter will display the high, low and the average of the stored MC readings. Wagner Meters’ IntelliSense™ Technology ensures that the MMI1100 is measuring deeply IN the wood for a true moisture picture without damage to the wood surface and without interference from surface moisture. 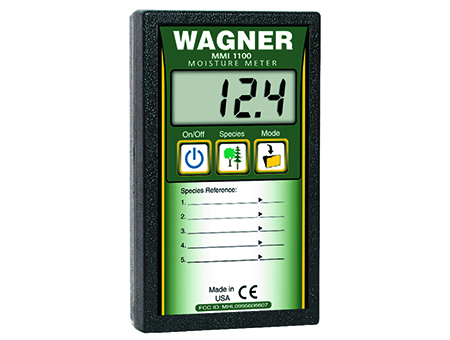 And like all of the meters at Wagner Meters, there is no need to adjust moisture content (MC) readings for temperature. The MMI1100, with its Press and Hold feature, allows you to take the MC reading in dark areas or hard to reach areas in the plant and the display holds the reading once the meter is removed, letting you quickly and easily view the MC reading. Lightweight, easy to operate, with an extended range SG and data collection capabilities, the MMI1100 gives quick and accurate MC readings right on the floor of the manufacturing site.